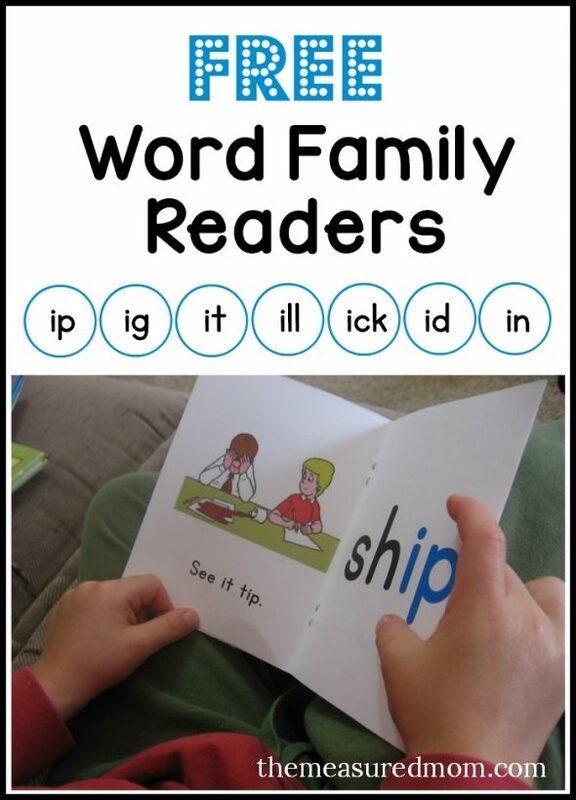 Learn to read short i word families with these free books! Today I’m sharing my second set of printable books that teach reading with word families. 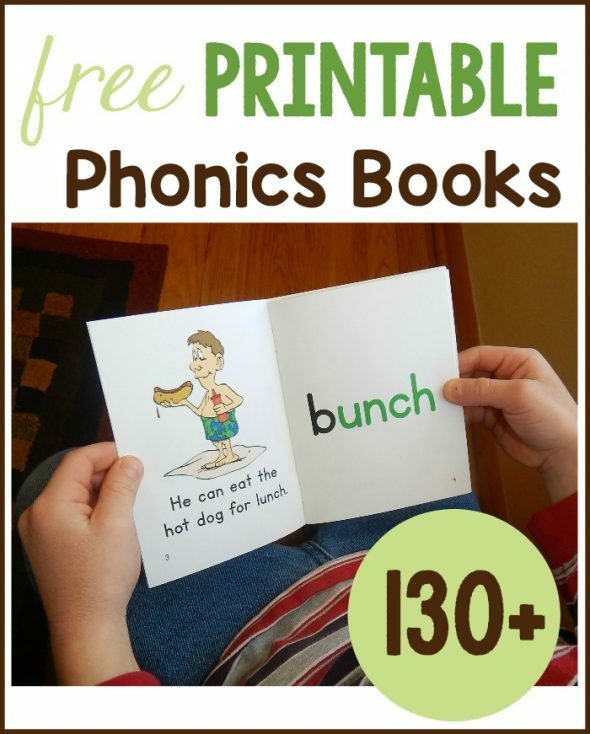 Even though I’ve shared a giant set of sight word readers, I also do a lot of phonics-related activities when teaching my children to read. We center our phonics work around word families. If you haven’t checked out my collection of hands-on word family activities, don’t miss them! I’m creating a set of phonics readers to use alongside my sight word readers. 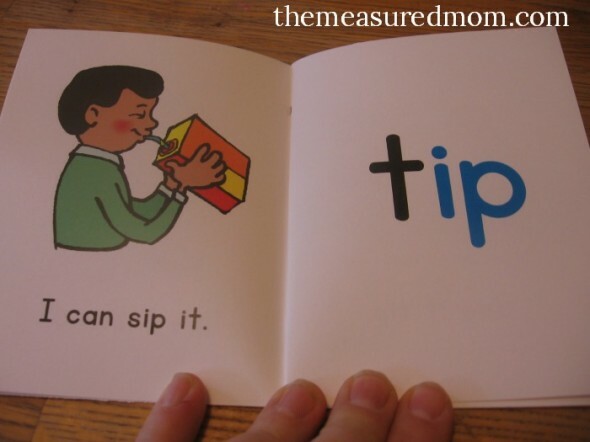 Each set of books features a particular short vowel. Time for short i! In my first collection (short a books), I explained exactly why I designed these and how to use them. Check out my short a phonics books if you’d like to know more. Each book’s cover has the name of the word family. I always help my Four figure out the word family’s name before opening the book. Each book begins the same, with another chance to identify the word family. The page on the right has a new word. 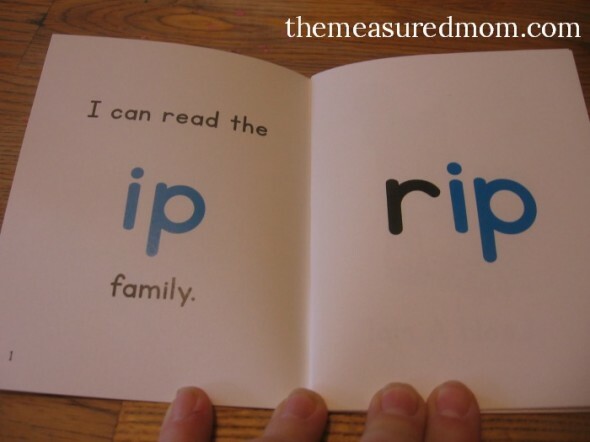 I use two different colors so your child can learn to read the word family as a single chunk. 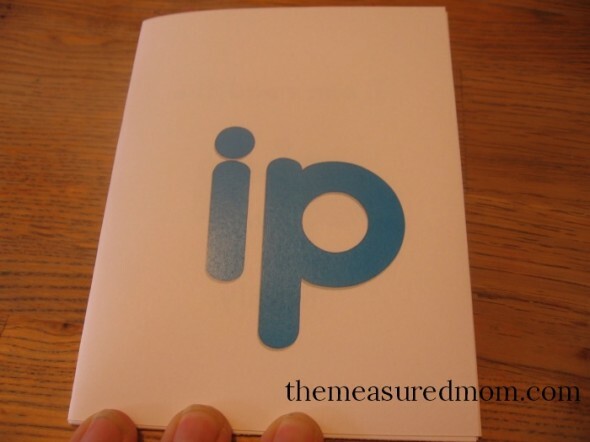 This word would be /r/ /ip/ instead of /r/ /i/ /p/. There’s no picture because I want kids to really focus on the letters. When you turn the page, the word appears again in a sentence. 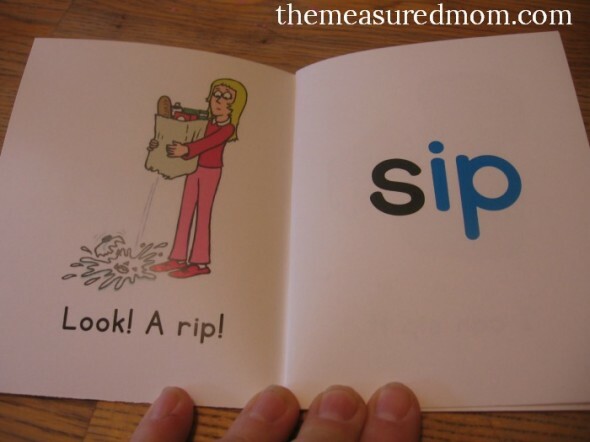 I’ve included only a small group of sight words which are listed on the back cover. 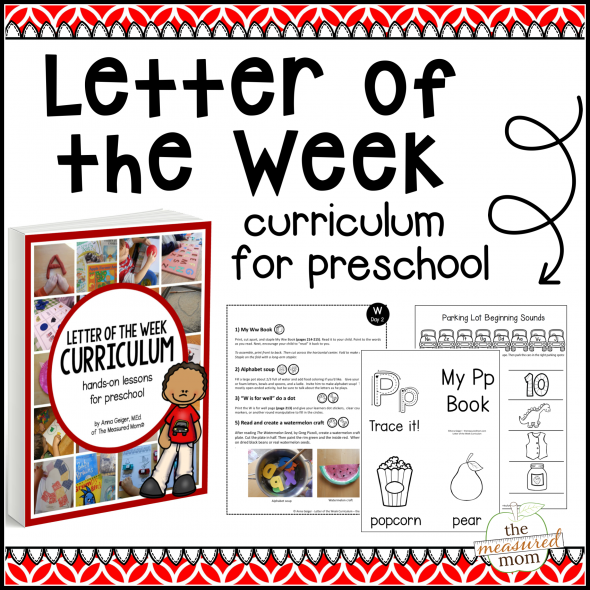 These books can be used to supplement your curriculum, but they work especially well with Reading the Alphabet. The short i readers are designed to be used after lesson 13. Your child always gets a chance to check his reading when he turns the page. 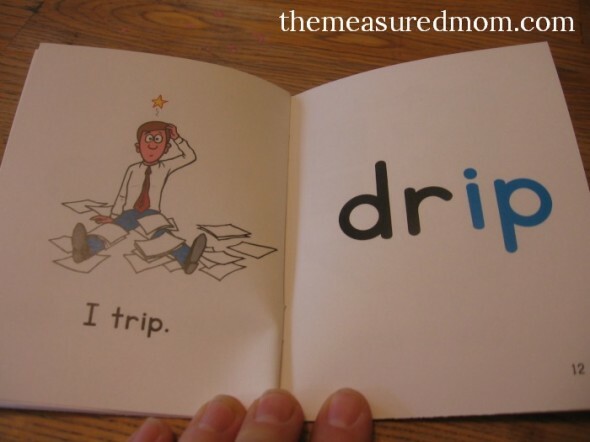 I add words that begin with digraphs (sh, th, wh, ch) toward the end of each book. Beginning blends are tough! After working at this one a little while (“/t/ /r/ /ip/”) my Four put the letters together himself! We were both excited that he figured out this toughie on his own. 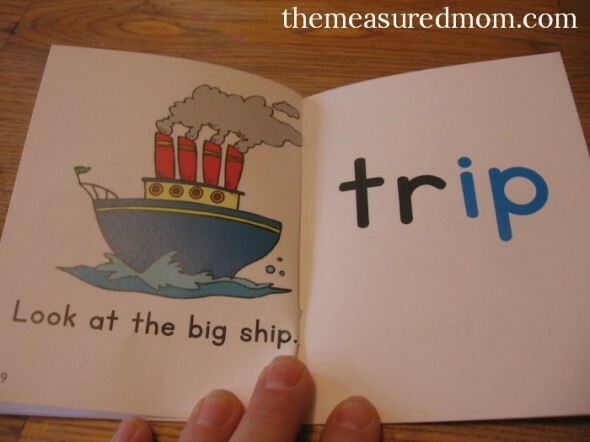 On the last page your child can read through all the words one more time. I am thrilled with how well these are working to help my little guy crack the “sound it out” code. For our first session with the short i books, he read four books and was done. We’ll pull out the rest another time. I hope you enjoy them – we are! 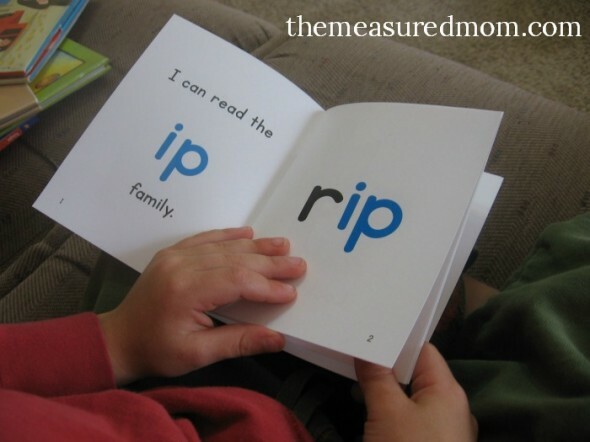 Follow The Measured Mom’s board Learning to Read on Pinterest. I can’t thank you enough! I was just given a kinder class this year and have nothing! This is a blessing and I cannot thank you enough! You’re so welcome – I’m thrilled you can use them! Be sure to check out my free printables page and other tabs at the top. There are LOTS of resources here for kindergarten. Thank you for these. I am printing them out right now to support our teaching at home. So excited to use these in a few weeks! I’m printing them tonight, along with the “summer” and “patriotic” sight word readers. We’re going through the a-family word books right now. I am so impressed with my 4-year-old’s progress. The best part is, that so far, reading is fun for him. My hope is that learning to read is never an unpleasant experience for him. Knowing you as I do, I’m sure he’ll always love it! I cant wait to use these for my son and children in class. You’re very welcome, Puteri! I hope you get a lot of use out of them. help. what am I doing wrong? when I print your phonic readers, I end up with four pages on a letter size sheet… so then the booklet doesn’t match up! I can see from your sample pics that you only have two pages per letter size sheet. Thank you so much for the wonderful stuff. May God bless you. I am trying to download (Short i Phonics Reader Set 2) but it keeps on telling me download failed or no file. Please can you help me to get the file. And also thank you so much for these they are so helpful. I’m having problems download also. It starts then stalls out and freezes both on my laptop and my desktop. I tried the download link you provided above with the same results. I also tried on both Google Chrome and Internet Explorer. Did you try the trick where you right click and choose “save link as”? Thankyou so much for all your handy resources!! I am a graduating teacher this year from Australia and use your tools a lot! Very easy and simple for a teacher who is starting out! I’m so glad these have been useful for you, Becc! I’m looking for phonics story books. If you have audio file, please share me! Sorry, I don’t have audio files! Thank you for your kind words, Dima! Beautiful work !! A million thanks for all of these .. Thank you for these amazing free reading materials . These helped me a lot cause we lack resources for books. These help a lot specially my slow readers. Thanks a million! Hi , thank you for the worksheets /ideas and all the supplies. it has been a great help to teach my kid and keep her occupied. Thank you for these GREAT free reading materials . These helped me a lot teach my kids . Thanks very much! I’m a kinder teacher from Jakarta, Ina. Your blog surely a BIG help. Thanks!